Watami Japanese Casual Restaurant: An Extensive Menu of Classic and Modern Japanese Cuisine! 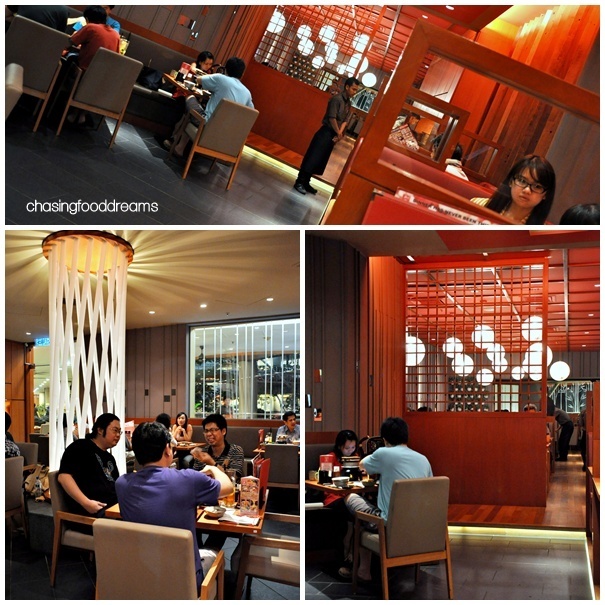 Serving modern Japanese dishes at affordable price and casual ambience! The much blogged about Watami had me curious. One day after a movie at One Utama, starving to boot, we found ourselves looking at Watami Japanese Casual Restaurant while strolling around the shopping mall. As it was still early for dinner, there was no queue and we were quickly shown to a booth for two. Watami was designed spaciously throughout the restaurant. Cherry wood mixed with grey, beige and red splashed across the whole restaurant and servers were also uniformed to blend into the whole ambience. Lighting was dim but sufficiently comfortable for a cozy dine in. Menu is filled with lots of choices of dishes from sashimi, sushi, appetizers and salads to hot food like hot plate grilled items, bbq skewers, fusion pizzas, sukiyakis, ramen and udons and even Japanese pancake called okonomiyaki. Lunch and dinners set meals are available as per the promotion time. Even the list for drinks (alchohol available!) and desserts are quite mind-boggling! Orders logged in the food arrived sufficiently on time despite the restaurant was almost full. Partner is a fried rice fanatic so we ordered a Ishiyaki Garlic Rice (RM19.90). Served in a hot stone bowl that was still sizzling as it arrived, a glorious array of scallops, prawns, crab meat and flying fish roes crowned the rice. When the bowl is still hot, pour in the sauce provided into the rice and stir the whole bowl to mix up all the delectable ingredients. The aroma is very enticing once the sauce hits the hot stone bowl. I purposely leave bits of the rice to crisp up at the bottom of the bowl for those delectable crispy brown bits of rice! The rice looked better than it tasted. It was average in taste simply because there was no oomph in the overall flavors. Yes, there is a bit of garlic flavor and a bit of seafood flavor but it did not leave a lasting impression for me. That said, the seafood was fresh and cooked nicely while portion is decent for its price. Tokujo Irodori Sushi (RM20.90) is a trio delight of Salmon, Eel and Tuna sitting on a sushi roll. Lightly glazed with a sweet soy sauce, each fish is dressed with a different touch of mayonnaise, flying fish roes, egg omelet and spring onion. This one was delicious enough and each fish provides a scrumptious flavor on its own together with the sushi roll. There is another version of this with salmon, scallop and shrimp! Kushi Moriawase (RM16.90) was my favorite that night. An assorted array of grilled chicken and beef had a lovely deep caramelized aroma when the plate arrived. Five skewers of shiny glazed meats was a sight for the eyes. On the plate, there was a skewer each of Chicken Wing (Teba), Chicken Gristle (Nankotsu), Beef and Eringi Mushroom (Gyuniku Eringi), Chicken Thigh (Tori Momo) and Roasted Beef & Spring Onion (Aonegi Gyuniku). I simply love the beef rolls as both were juicy and very sumptuous in flavors and textures. The various parts of chicken skewers also fared delicious. I have read several reviews that this was not that great but the one I had that night was the opposite of what I read as the flavors were really robust and very aromatic with a moist and tender texture. A classic Japanese street food fare executed to near perfection in my opinion! I am a big fan of Japanese Okonomiyaki so ordering Hiroshima Okonomiyaki (RM16.90) was a must! The thick pancake was served on a hot plate topped with the brown okonomiyaki sauce, mayonnaise and bonito flakes dancing to the heat of the plate. Filled with cabbage, onion, carrot, there is also prawns, scallop and beef. A lovely mixed of flavors exuding sweet and savory flavors from the vegetables, seafood and beef. The sauce also complimented the sweetness while the bonito flakes added a savory element to the dish. There is also another version with rice cakes (mochi) and cheese which I wouldn’t mind trying. Miso Soup (RM3.90) is a must for me to finish off any Japanese meal for that soothing comfort feeling. Overall, the food at Watami Japanese Casual Restaurant was good but I wasn’t impressed with that wow factor. Maybe I had too high expectation from reading other reviews or I had ordered dishes that were not their signatures. Service on the other hand was excellent as our food arrived fast and wait staff was attentive and friendly. Price is also decent as the portion and quality served was great value. That said, I would still return since there is so much more in the menu that sounds utterly delectable. Total bill for two is RM86.35 (with 10% service charge). I am so in love with Korean BBQ! One lazy Sunday with no plans, we braved the roads and head to Jalan Ampang towards Korean town for some BBQ. Luckily for us, most people were either feeling lazy or they have other plans far away from where we were going, so the roads were clear and the journey was fast. Arriving in Korean town, choices were many and decision is tough. Finally, we settled on one of the least obvious or fancy one. Chung Wa Dae seemed to have been there for a bit and the fact that the owner was outside, he greeted to us with a friendly smile and asked us to try his restaurant. We entered and found the place to be cozy and setup family style with long wooden tables spread across the room. There are even private rooms available. Although air conditioned, plenty of standing fans were also present to ensure a good ventilation. A television blasting Korean pop artist music videos signified that we are definitely in a Korean restaurant! A wall of fame hosted all the diners that enjoyed Chung Wa Dae! Menu was fairly simple and ordering was straightforward. Ala carte and set meals are available. We logged in our order for a BBQ Special Set for 2 to 3 person (RM68.00) that had four varieties of meat of pork and beef. As with all Korean BBQ meals, I always looked forward to Banchan, the infamous side dishes of delectables, served along the grilled meat. At Chung Wa Dae, I noticed the generosity of their Banchans as there was 12 choices served. Quite a lovely variety if I may say so since quite a few of them was unique and delicious! Simply the quintessential dish of Korea, Kimchi is readily available nowadays but a good one is not that easy to find. Chung Wa Dae’s version is quite marvelous as the chili sauce is thick and sticks to the pickled Chinese lettuce. A good balance of spicy and sour flavors had me refilling this dish several times! Egg in Soy Sauce is unpretentious and comfort food at its best! My family thought the chilled spicy squares looked weird but I know otherwise. It is actually a cold Konyaku Jelly with Spicy Sauce. It may be weird for some but my palate said it’s actually quite good and refreshing. The cold jelly actually offsets the spicy sauce to balance out and provide a nice mellow flavor of spiciness. Our BBQ set arrived and we had Fresh Ribeye Sauce BBQ, Pork with sauce BBQ, Pork Jowl BBQ and Fresh Pork Belly Slice. Firstly, heat up the grill with hot coals beneath! Lay the least flavored meat, Pork Jowl BBQ and Fresh Pork Belly Slice, to enjoy the original flavors of the meat before proceeding to the marinated ones. Enjoy with the condiments of lettuce, fresh garlic, fresh chili, spicy sauce and sesame oil with salt and pepper. The next one of Pork with sauce BBQ lies over the hot coals. Caramelized till perfect and slowly savor its juicy and sweet tender pork. This one is almost perfect in my books. Here comes the Fresh Ribeye Sauce BBQ! This one takes only a few seconds to cook for a tender bite. Sweet and savory, the beef was oh-so-good!! Load up the beef with marinated Spicy Scallion for a spicy touch! Korean served their Steamed Rice (RM5.00) in metal bowls with covers. I am a sucker for rice so needless to say; I had to have my rice. Partner on the other hand enjoys noodles so we decided to order Warm Noodle with Seafood (RM15.00). Lots of plus points at Chung Wa Dae Korean BBQ Restaurant! Service was fast and efficient, lots of banchan choices plus refills, portion of dishes are a good size and flavors are sumptuous. Water was complimentary. Total damage was RM93.00 with a 10% discount on cash basis. Birthday diner gets an additional 5% discount. Jalan Ampang Utama 2/2 Ampang. Chef Lim Organic Kitchen, Old Klang Road: Let’s Get Healthy Together! Modern Healthy Organic Vegetarian Dishes with a Twist! My family and I often feast on vegetarian at least twice a month for religious purposes and frankly, we do enjoy going meatless at times like this. We are also on the constant look out for new vegetarian places to dine just to be adventurous. A recent invitation led me to Chef Lim Organic Kitchen located in Scott Garden, Old Klang Road. Easily located on the main road of Old Klang Road, the fairly new restaurant stood out nicely with a big bright sign on the building of Scott Garden. 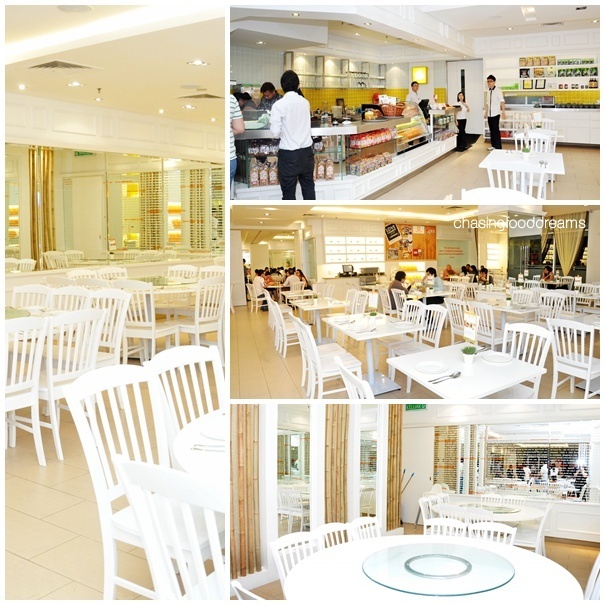 A fairly huge restaurant, the whole place is mostly white to feature a clean and crisp ambience! Simple and spacious, the whole restaurant has a comfortable ambience as soon as one enters. A whole wall of shelves are dedicated to selling organic food products while another wall features a Love Charity Corner where the restaurant donates a percentage of their sales to charities. Mirrors are also everywhere to reflect an even bigger space for diners to enjoy their meal in comfort. The restaurant is big enough to even have private function rooms! Fresh Coconut is also available to cool off body heat or simply for thirst quenching benefits! Here are the Fundamentals of Chef Lim Organic Kitchen! We started off our meal with a beautiful Fruit Tea. A refreshing and delicious tea base perked up with loads of fruits like apples, orange, and passion fruit and sweetened with honey! Everyone enjoyed this tremendously as the fruit tea was just fruity and sweet with a hint of citrus. After the lovely fruit tea, we were served the Feel Good Tea during our meals. The tea has a cleansing benefit with ingredients like chrysanthemum, Ting Fa Chou, Yong Sam Chou and Xiong Chi. Its cooling for the body and aids in digestion of our meals. First up was Crystal Jade Roll, a beancurd sheet rolled up, wrapped with seaweed, deep fried and served with a fruity sauce. Sounds complicated but flavors are quite basic with a good balance of sweetness from the mango fruity sauce. Crispy and light, this was easy to eat and since there were young children, they seem to like it too as it only has a hint of spiciness to it. Yam Ring Basket was a classic with this version filled with stir-fried vegetables and cashew nuts. Flavors were light and clean with wholesome goodness from the creamy yam contrasting with the crunchy vegetables. An unusual curry, I do admit to loving the Kapitan Fish very much! The curry was lighten up with yoghurt instead of the usual coconut milk and the tangy gravy is loaded with eggplants, lady fingers and beancurd products. Spicy and creamy, I flooded my rice with the gravy!! Basil Leaf Mushroom had everyone commenting how aromatic the dish was due to the basil herb. Baby corn, fresh shimeji mushrooms, black wood ear fungus, carrots and bell peppers were lightly stir-fried with an earthy flavor. I like how the vegetables retained their crunch. A baked dish covered in cheese arrived and we were told that this is a popular dish mimicking the Hong Kong Chan Char Teng of cheese baked rice. Mushroom Cheese Baked Rice has aromatic mushroom fried rice embedded beneath the crusty creamy cheese. It is fairly simple and flavors are well balanced with everyone heading straight for the melted cheese…including me! Lo Han Chai shouted homemade from the get go! A medley of broccoli, cauliflower, shitake mushroom, straw mushroom, carrot and fried Tau Kan is light and flavorful. The brown sauce has a slightly sweet taste and proved that a good dish doesn’t necessarily have to be heavy in flavors. Again, kudos to the chef for retaining the crunch in the vegetables! If you like mushrooms, you would definitely enjoy Shitake Mushroom Herbal Stew. An array of fresh mushrooms takes the cake here with a light herbal stew cooked with goji berry and red kurma dates. A new one for me, I like the herbal flavors in the dish with a refreshing aftertaste. The last dish was a dark horse! Fruit Pizza was something new since it is hardly ever heard in Chinese or Italian restaurants. I detected green apple slices and strawberries among the ooey gooey cheese and pizza base. Sweet, tangy and savory from the combination of the fruit and cheese, the pizza was fabulous!! Everyone kept raving on how scrumptious the pizza tasted and how well the flavors and textures are in the baked bread. It is also surprisingly light and quite refreshing despite the oodles of cheese. A Must Order at Chef Lim Organic Kitchen!! Chef Lim Organic Kitchen uses Vegetarian Cheese without animal rennet and is imported from Australia. A taste of this cheese and I found it creamy and nutty with a buttery flavor. Too bad this is not available here as I would have loved to purchase this for my cheese dishes. Brown Rice is served for a healthier option! The meal ended with a refreshing chilled Mango Pudding and Coconut Pudding. I prefer the latter for its refreshing taste of coconut which makes a good palate cleanser. The man responsible for the restaurant is Mr. Koo, General Manager of The Jas Sdn. Bhd. who was also available that night to explain his concept of providing customers with a healthy vegetarian restaurant for a healthier lifestyle! *Thanks to the team at Chef Lim for the invite!